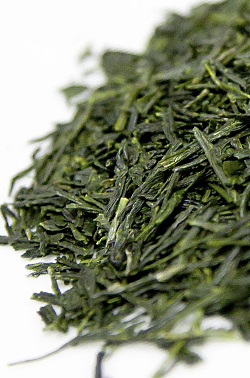 What’s the difference between Japanese and Chinese green tea? As I did last month and the month before, I took a look at some of the search terms that brought people to this blog and found a question that I didn’t really address. This time: “What’s the difference between Japanese and Chinese green tea?” The obvious smart-aleck answer is that one comes from Japan and the other comes from China, but it runs a bit deeper than that. First off, it’s not the plants themselves. The first varietal discovered of the tea plant is Camellia sinensis var. sinensis: the Chinese tea plant. About 1400 years ago, during the Sui Dynasty, Buddhist monks introduced tea — and the tea plant — to Japan. This means that the same varietal of tea plant is growing in China and Japan. Terroir, on the other hand, can definitely have an effect. The climate, soil, and other factors can definitely affect the taste of the tea. Also, the Japanese have been crossbreeding and developing their strains of tea plant for over a millennium. The biggest factor in the taste, though, is a very simple one: the process. The difference between black tea and green tea is oxidation. Black tea is fully (or near-fully) oxidized, while green tea is not oxidized at all. There is an enzyme in the tea leaf that starts the oxidation process as soon as the leaf has been broken or bruised. Making green tea requires a “kill green” step that destroys the enzyme and stops the tea from oxidizing. That step requires heating the tea leaves quickly to at least 140 degrees. To make Japanese green teas, such as sencha, bancha, and gyokuro, the leaves are steamed. To make Chinese green teas, such as dragonwell or gunpowder tea, the leaves are pan-fired. Just this simple difference in processing gives Japanese teas a rich grassy flavor and Chinese greens more of a vegetal character. Granted, I am oversimplifying, but this is the fundamental answer to the question. Posted on 18 November 2012, in Styles & Blends and tagged bancha, Camellia sinensis, China, Chinese tea, dragonwell, green tea, gunpowder, gyokuro, Japan, Japanese tea, sencha. Bookmark the permalink. Leave a comment.